RECESS wRECklESS RAIL JAM 2016 at BEECH MTN! Saturday February 27th! 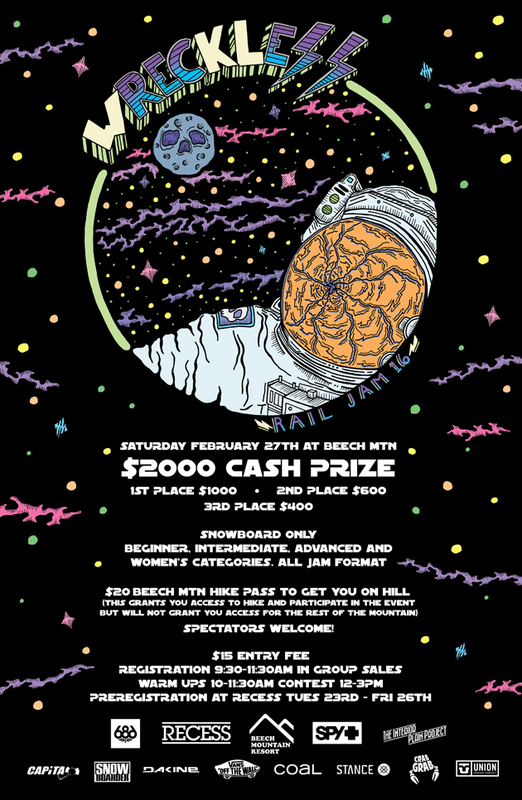 Biggest CASH PURSE rail jam in the Southeast! $2000 up for grabs! This is a jam format snowboard-only rail jam. Beginner, intermediate, advanced and women’s categories. Tons of sponsors, prizes, cash, raffle and good times! Spectators welcome and encouraged! You do not want to miss this one! $15 Entry Fee. Beech Mtn will be offering a $20 hike pass that will grant you access to the event only if you wish to participate or you can purchase a ticket for access to the entire resort. Preregistration at RECESS Tuesday Feb 23rd – Friday Feb 26th. Sponsored by RECESS, SPY, CAPITA, UNION, COAL, CRAB GRAB, 686, VANS, RED BULL, DAKINE, INTERIOR PLAIN PROJECT and SNOWBOARDER MAG!